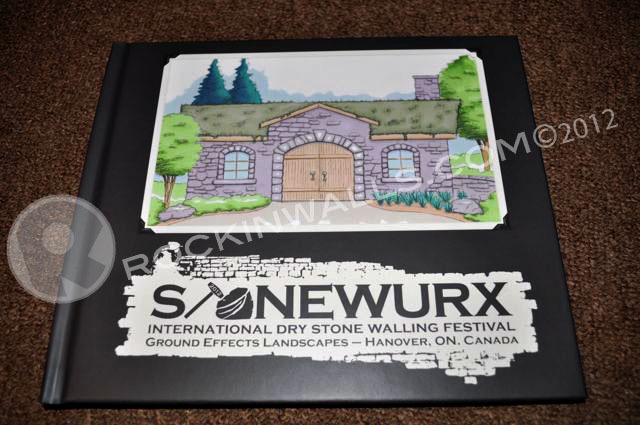 ROCKIN WALLS: StoneWurx - Ground Effects Landscapes THANK YOU! 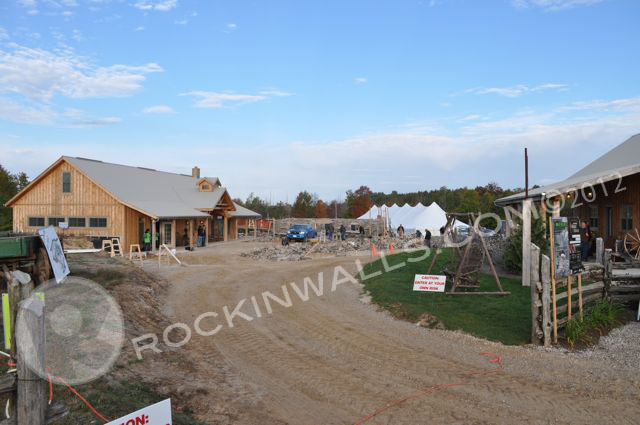 In September I had the opportunity to participate at the StoneWurx 2012 International Dry Stone Walling Festival. Hosted by Ground Effects Landscapes in Hanover Ontario Canada. 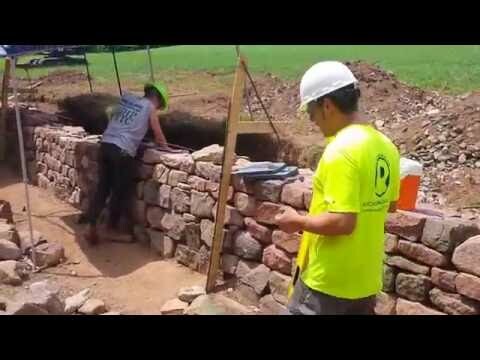 A once in a lifetime opportunity to work alone side some of the best wallers of my time and a historical landmark - a Stone Stable 40 feet long x 20 feet wide and 7.5 feet high. Topped with a green roof made up of small succulents called sedum. On December 24th I received a care package including a personal "Dear Mark" thank you letter, StoneWurx signed t-shirt by all the Key Wallers at the event, a beautiful book with images from start to finish-media images of all the wallers - event - workshop - setting the roof and a card with the sketch and finished structure . 51 pages of images and copy start to finished - printed by blurb - created by Brydges Landscape Architecture inc.
How could this experience get any better then what I experienced?! The warm welcome, lunch and dinner meals serviced on site cooked by Donna, lodging, a hat with the Canadian flag, true team work while building the structure.... I could go on and on. A- THANK YOU Care package - I would have come back again just because I loved the welcoming hospitality and everything else about this festival had to offer. Tim and Donna Kraemer owners of Ground Effects Landscapes took this event very seriously as seen in this photo. (image staged - otherwise you'd never see them without a smile) They had their work cut out for them. But you won't know it! The event went like clock work. With there professional team handled every aspect needed. Everything went as planned. Keyword planned! I have been to a few stone events in the last couple years nothing could compare to this one. Even the wallers from Great Britain commented on how incredible this event was. 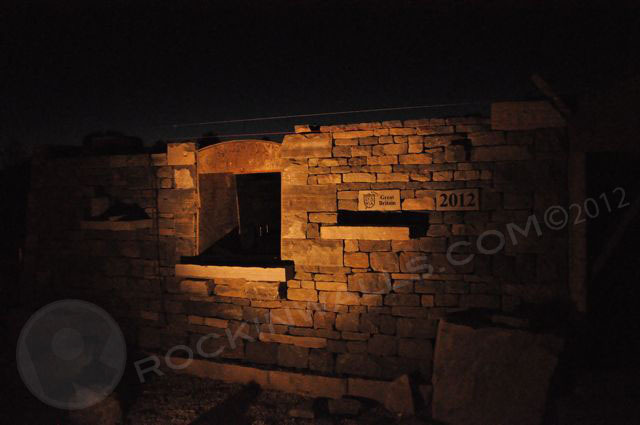 Lord knows they see many more stone walling events then we do in North America. Tim and Donna Kraemer - GET IT! When I say that I mean they treated everyone like a professional business would. The thank you package was just another example of why a business like this will only continue to succeed! The words Thank You - go a very long way. Dean, US wallers, UK wallers, Canadian wallers, spectators, hosts..... everyone who gave a hand in one way or another. THANK YOU......job well done!